CHAIN SLINGS SYSTEMS – Slingtek W.L.L. Alloy Chain Sling are usually the best choice when working under rugged and hot weather conditions such as construction sites. They are durable, long lasting and easy to inspect. The main advantage with chain slings is that they can easily be reparied if any damaged component or link is found during inspection. We manufacture chain slings conforming to BS EN 818-4. The distance between the crane hook and the load is known as the “Head Room”. 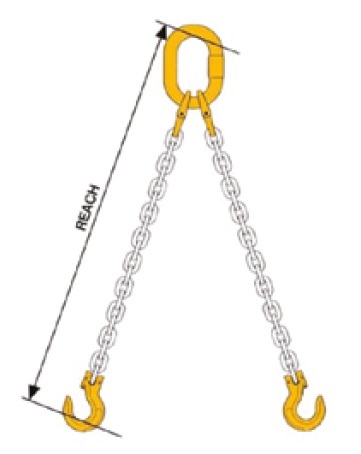 If a specific head room is required, the “Reach” of the chain sling must increase as the angle between the legs increases as shown below. The reach of a chain sling is the distance between bearing points of the upper and lower terminal fittings. 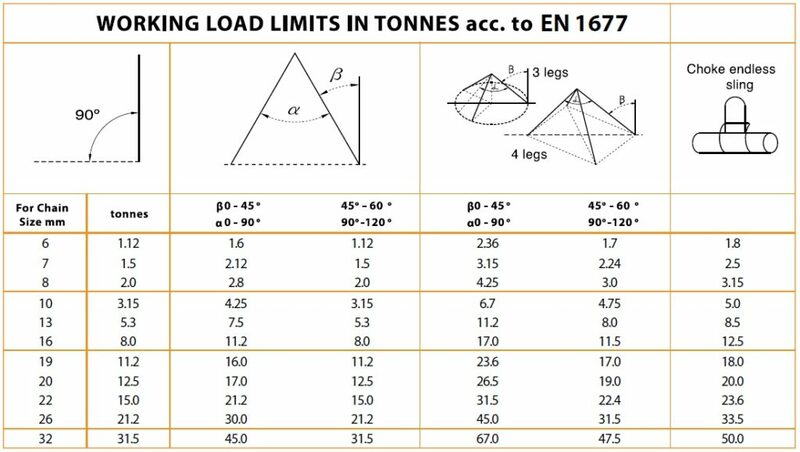 This distance, commonly known as the “Bearing to Bearing” should be quoted when ordering slings. Shortening clutches may be fitted to a sling, making the reach adjustable, hence increasing the versatility of the sling. 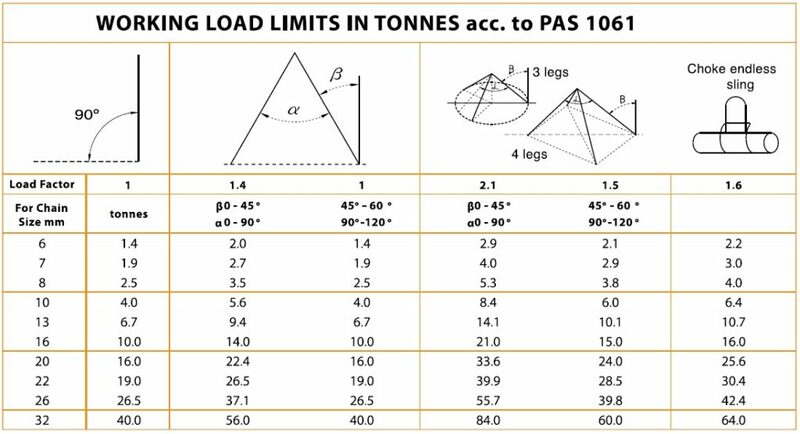 All general purposes slings should be rated by the uniform load method as shown in the table below. Slingtek alloy chain or chain slings should not be used in acid or caustic solutions nor in heavily acidic or caustic laden atmospheres. The high tensile strength of the heat treated alloy material in alloy steel chains and components is susceptible to hydrogen embrittlement when exposed to acids. Slingtek slings must not be heat-treated, galvanized, plated, coated or subject to any process involving heating or pickling. Each of these processes can have dangerous effects and will invalidate the manufacturer certificate. When using Slingtek slings in exceptionally hazardous conditions, the degree of hazard should be assessed by a competent person and the Working Load Limit adjusted accordingly. Examples are lifting of potentially dangerous loads such as molten metals, corrosive materials or fissile material and including certain offshore activities.